Our product range includes a wide range of paper laminated hdpe bag and paper laminated bags. Manufacturing and supplying of supreme quality Paper Laminated Fabrics has helped us achieve a very high level of trust in the market. These bags are available in attractive multi-colored prints, varied range of sizes and capacities. Waterproof and re-usable, these lightweight bags are highly acclaimed in the business, for their supreme finish and durability. These are made available from our side as per the set industry guidelines and at extremely affordable rates as well. Manufacturing and supplying of supreme quality. 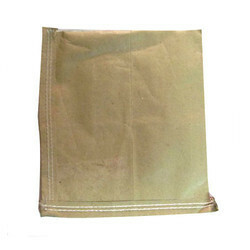 Paper Laminated HDPE Bags For Milk Powder has helped us achieve a very high level of trust in the market. These bags are available in attractive multi-colored prints, varied range of sizes and capacities. Waterproof and re-usable, these lightweight bags are highly acclaimed in the business, for their supreme finish and durability. These are made available from our side as per the set industry guidelines and at extremely affordable rates as well.